Okay, forgive me for using my newfound education. I promise I'm not this nerdy, at least for this kind of stuff. In our Western world, we talk about "what's in the heart," or "let your heart guide you" and other similar phrases. In Christian circles, we tend to steer away from those kinds of phrases, because as Jeremiah 17:9 says, "The heart is deceitful above all things, and desperately sick; who can understand it?" The problem with our pendulum swing is that we try to crush emotions, Vulcan-style. However, God made emotions to show us where we are in our souls. This is another matter, probably addressed later in this series, but emotions are a good thing, but we shouldn't be controlled by them. Sometimes we say, "I feel in my heart." In our context it somewhat makes sense. But here's the rub. In Hebrew, bEl means "Heart, Mind, Will." That's our whole being. Our decision-making skills, emotional reactions, logical thinking, etc. 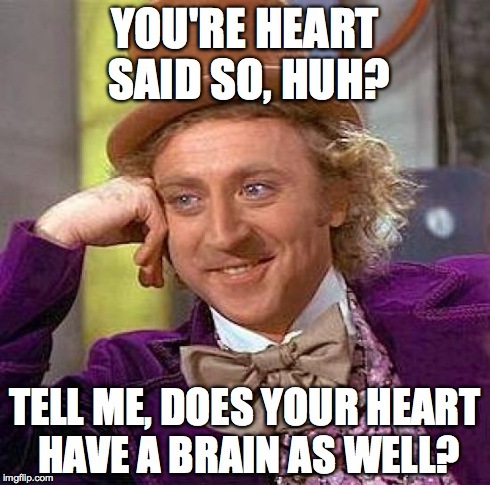 One commentary says "When translations use the term 'heart,' it is usually wise mentally to replace it with 'mind.' In fact, the seat of the emotions for the ancient Israelites was the stomach or the kidneys, like a "gut feeling." I guess they took the term literally. To me, this addresses how I've reacted emotionally over the last three decades, but also addresses how I react as a whole to my beliefs and how they are challenged. Does the Word of God poke and prod at my mental capacities? We live in a world that goes by emotions, and sometimes that leads us on a ridiculous roller coaster. We have to be prudent with what we hear, learn, and experience all at once. We see/interpret things through a personalized paradigm. Because of these factors, this kind of prudence forces us to slow down. And we don't like to slow down. - What do you believe... about life and God? - Why? Was it just a gut reaction, or were your conclusions based on wrestling through it? - Do you think your beliefs are absolutely conclusive, that there's nothing left to learn? Take the necessary steps to understand your world around you.